President Trump’s first SOTU following his first year of making America great again with tax reform and an economic revival was the opposite of Obama’s first year in which he lauded the increase to the welfare rolls, or his last in which he presided over the economy his regulations had stagnated and the Islamic Jihad he had helped to revive. Trump proudly announced sending the Thousand Year Caliphate of the Islamo-Nazis of ISIS the way of the Thousand Year Reich, and how he was willing to make a deal to give DACA a path to citizenship and reform America’s immigration. 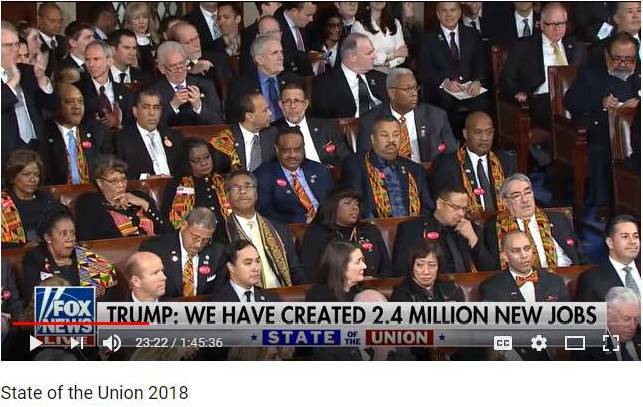 But Democrats will have none of it casting Trump and Republicans as racist even as they sat in the chambers on their thumbs as the president announced that black unemployment was the lowest on record since 1973. There was nothing but bad news for Democrats who are losing their welfare voter slaves and watching Americans become prosperous and self-sufficient once again. Democrats are unneeded in an America where the government is not crushing the economy and creating dependency. Democrats slander the economic boom under Trump as being “crumbs,” yet Obama goes out and thanks himself for it as if he had anything to do with it. His last SOTU was of how Americans are repaying the world and living their “new normal” economy. Pelosi lauded people getting a $40 raise in their paychecks under Democrats and then spits on it when they get the same under Trump plus a $1000 bonus! She smears tax cuts for the rich yet she happily takes a six figure tax break. Where Obama brought illegals and welfare hogs to his addresses Trump brought working Americans and patriots. America triumphant is exactly what Democrats do not want. Americans not dependent on government, not begging for the scraps that are all that Democrats offer, is the opposite of what the Left wants. How do they convince the masses that stealing from those who make good money is great for them when they are the ones making good money? High taxes only benefit Democrat politicians but taking from businesses and putting people out of work so they must turn to government for handouts. Democrat regulations only benefits their crony donors who want to beat down their competition without having to compete and get tax breaks and loopholes for themselves. What liberals know of Republicans they learned from Little Orphan Annie. What they know of racism they learned from pathological liars. What they learned of socialism they learn from indoctrinators. What they learned of capitalism they learned from communists. What they learned of religion they learned from Nazis. Liberals are so far behind the learning curve that the voting age should be raised to thirty so that those who vote make informed, intelligent decisions rather than just obey as zombie lemmings doing what they are told and jumping off the cliff. This entry was posted in Congress, Conservatism vs. Liberalism, Economy, Illegal Immigration, Obama's legacy, Politics and tagged Democrat hate, Donald Trump, SOTU 2018, Trump Economic Revival, Trump's Immigration Plan, Unemployment records. Bookmark the permalink.